No comment needed – enjoy this pastiche from The University of Kansas! A choir of book angels! Aren’t these beautiful? 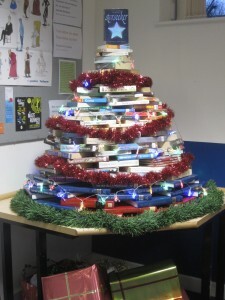 Am totally collecting suitable books and learning how to do these for next year! Thank you to Alison Tarrant who learned how to make these at the East Midlands YLG Unconference earlier in the year. It’s that wonderful time of year again, when I get pictures of amazing displays in my email! 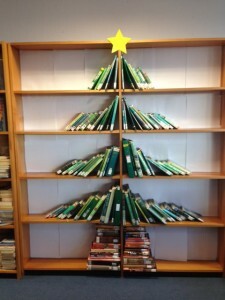 Yesterday, not one but two beautiful and very different Christmas tree book displays were sent to me, and I love both of them, don’t you? 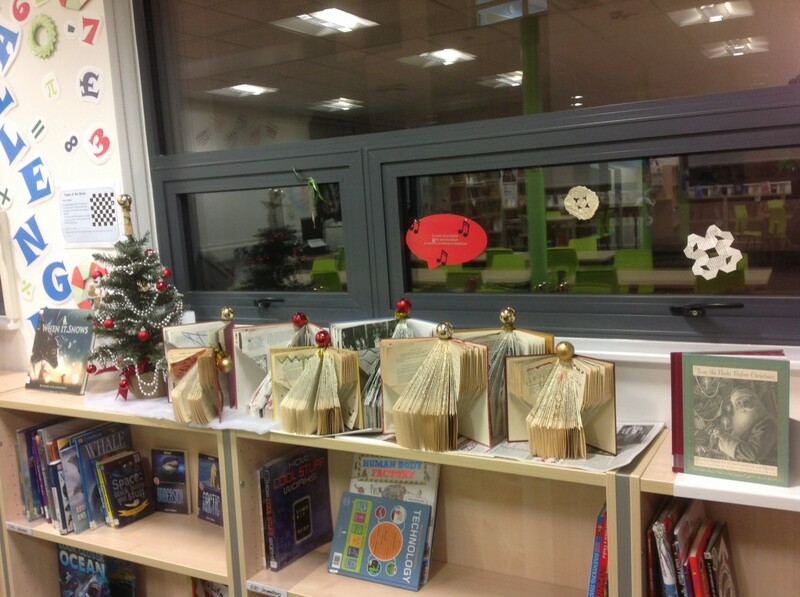 The first tree, minimalist on empty shelves is in Alderley Edge School for Girls in Cheshire and was created by librarian Ruth Wood; the second is in St. Mary’s Catholic School in Bishop’s Stortford and was created by the librarian Emma Halford, with help from the teaching assistants who suggested that she find a book with a star on the front to go on the top of the tree! I love both of these, and if you have any lovely Christmas displays, videos, or anything else seasonal to share, do send them to me. Two colleagues from the University of Kent are conducting a UK wide survey on copyright, and they would very much like our help with this. Dr Jane Secker writes: ‘This research is part of an international project originating in the National Library of Bulgaria and analyses have already taken place in Bulgaria, Croatia and Turkey (July – October 2013) and in France (January-March 2014). Further research is currently taking place in Finland, Hungary, Italy, Lithuania, Mexico, Norway, Portugal, Romania and USA. We are calling on all librarians, information professionals or those working in educational, cultural and scientific institutions within the UK to complete this survey before 31 December 2014. In other countries the head of the library (rather than the copyright officer) has completed the survey, but we would welcome multiple responses from people at the same institution. Please do consider completing the survey yourself, but also help us to raise awareness of the survey in the sector more widely. Please complete the survey – it doesn’t take long and it will help give the bigger picture. We all are really keen, after all, for copyright, especially on electronic resources, to be sorted out!